On December 16, 2017, a coalition of artists, activists, and community organizers hosted an alternative tour and protest of Westbank's #FightForBeauty exhibition. See the original press release issued by the organizers below. The alternative tour presents a counter-narrative to the exhibition audio guide read by Westbank founder Ian Gillespie. The audio guide (linked here) frames the exhibition’s artworks as the spoils of victory over city regulation, with Gillespie recounting indulgent anecdotes of Westbank’s attempts to push through development projects in the face of community and government opposition. This action is in response to what the group suggests is “an attempt to rebrand gentrification and displacement as an art practice.” They believe that Westbank and development corporations like it are responsible for accelerating Vancouver’s ever-worsening housing affordability crisis. The action will feature a roster of local speakers (listed below). The alternative tour and action will take place at the Fight For Beauty tent on what was originally advertised as the final day of exhibition, Saturday, December 16. Fight For Beauty is located between two Westbank developments, the Shaw Tower and Fairmont Pacific Rim along Canada Place in Downtown Vancouver, B.C. The core organizing group for this action, the Woodward’s Anti-Capitalist Society, a group of artists and writers who have been independently researching the Downtown Woodward’s site and its redevelopment. 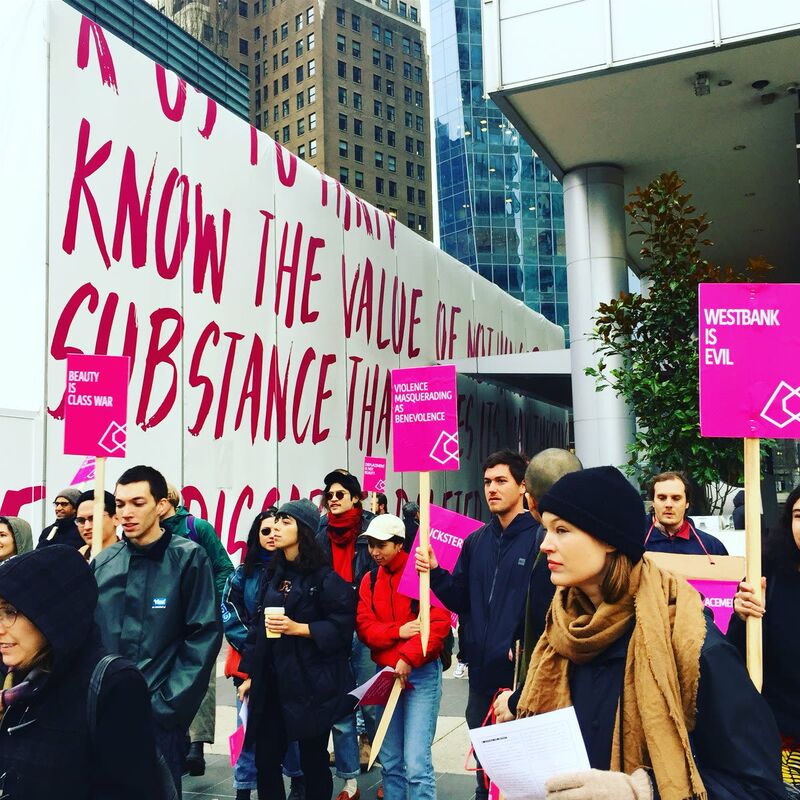 The group has started an open letter for artists to sign a refusal to work with Westbank in solidarity with groups organizing against gentrification and displacement in Vancouver. The open letter will be presented at the alternative tour. “If they fight for beauty, we fight for housing. It’s time we organize for our right to live in this city. Developers like Ian Gillespie seem to be accelerating displacement,” says co-organizer Gabi Dao. “In a city gripped by a housing crisis, we can’t let Westbank enact violence masquerading as benevolence,” says artist and writer Byron Peters. “This exhibition is elitist and egotistical - we want more affordable housing and less luxury condos. We came here to disavow this exhibition,” says co-organizer Josh Gabert-Doyon. “Westbank claims that they promote arts and culture, but artists are being priced out of their homes as a result of the veracity of Westbank’s development projects,” says artist and writer Brit Bachmann. “This is not art, this is a condo advertisement,” says local art critic and speaker, Steffanie Ling.